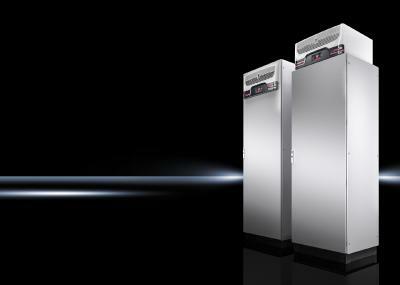 The Rittal energy-efficient Blue e+ cooling units are now also available in a roof-mounted version for the very first time. The units, which are suitable for enclosures from a size of 800 x 600 mm (W x D) upwards, have a cooling output of 1.3 kW. This means that cold air can also flow from above around the devices installed inside the enclosure, such as frequency converters. Alternatively, cooling can also be provided in combination with the new VX25 large enclosure system as a complete integration solution. Roof-mounted cooling units are the top choice in control and switchgear engineering when heat has to be routed above the enclosures and then outside. This is the case, for example, when enclosures are bayed and there is enough space for the cooling units to be wall-mounted. Since ambient air is drawn in at the front of the cooling unit and then expelled again, there is no need to adhere to minimum distances to neighbouring appliances or to walls. The air routing within the enclosure is also optimal: The cold air is blown out in the front part of the enclosure and so ideally dissipates the heat from top-mounted components such as frequency inverters. The new roof-mounted cooling units of the Blue e+ series, like the existing wall-mounted units, work with a combination of heat pipe and conventional compressor technology. Since neither a compressor nor a pump is called for when cooling via heat pipe, the energy consumption is very low. Only the fans, used to transport the air past the heat exchangers, need to be supplied with electricity. This cooling method works especially well if there is a large temperature difference between the inside of the enclosure and the surroundings. The additional compressor in the cooling units only operates when a larger cooling output is required. The compressor cooling is also very energy-efficient: All the active components operate with speed-controlled drives. The cooling output is thus always exactly as high as required and less energy is consumed. Overall, depending on the ambient conditions and the application, cooling units of the Blue e+ series use 75 percent less energy on average than conventional compressor cooling units do. The lower temperature deviations within the enclosure mean that the service life of the components installed is extended. The new devices also have a multi-voltage supply and are thus easy to operate at all common mains voltages and frequencies. This is a huge benefit, especially for those engineers who sell their machines worldwide. Operation is comfortable and intuitive thanks to a modern touch display on the front, which is used to make the basic settings and to display the status messages. The touch display can also be integrated into the door of the enclosure as an option. Another option available is the IoT interface, which makes it simple to integrate the cooling unit in an Industry 4.0 (IoT) environment. The Blue e+ cooling unit is also employed in the new Rittal integration solution. In this plug & play solution, the cooling unit is installed directly in the upper section of the VX25 enclosure. Instead of retrofitting a standard enclosure with a climate control solution, this integrated unit provides the user with a complete system consisting of an enclosure including climate control. Operation is easy via the touch display built into the enclosure door. The cooling unit can be easily withdrawn for maintenance purposes when the door is open.